Jezebel was the wife of King Ahab and thus Queen of Israel in the mid ninth century B.C.E., portrayed as the most wicked woman in the Bible. 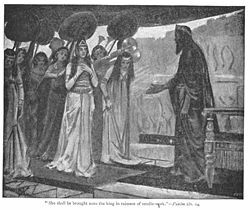 A Phoenician princess, her marriage to Ahab portended peace and prosperity for Israel, but alienated the partisans of the Hebrew God Yahweh, who strongly denounced Jezebel for supporting Baal worship. 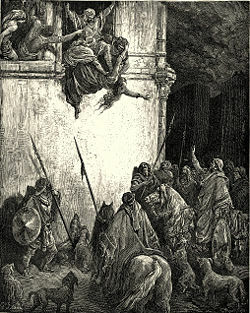 Jezebel responded by persecuting the prophets of Yahweh, and an increasingly violent and bitter struggle for supremacy ensued. After Ahab's death, Jezebel continued to hold influence through her sons Ahaziah and Joram, who succeeded her husband on the throne. Her daughter, Athaliah reigned for several years as queen of Judah, the only woman to rule either Judah or Israel as queen. Jezebel's lineage thus merged with the Davidic kings. Though seldomly acknowledged as such, she is thus one of the ancestors of Jesus Christ according to the genealogy implied in the Gospel of Matthew. Jezebel lived at a time when the northern Kingdom of Israel had established itself on a firm foundation of independence and even superiority in relation to the southern Kingdom of Judah in the early ninth century B.C.E.. She was the daughter of King Ithobaal I of Tyre. A Phoencian seal from roughly the same period bears letters yzbl, a close equivalent to Jezebel. Several interpretations of the name have been offered. One suggested she was a high priestess of Baal Melqart (b'l), as was sometimes the case with royal daughters. Another suggested that both Yahweh and Baal were honored in her name, which would be consistent with her own sons and daughter being given "yah" names (Althaliah, Jehoram/Joram. and Ahazaiah). Other less flattering interpretations suggest the name means un-husbanded or even dunghill. Whether or not this song actually pertains to Jezebel, it captures the hopes that the court of Israel must have held upon her arrival. Jezebel, however, did not "forget her people and her father's house." Indeed, she seems to have brought with her a large number of attendants, including priests of the Phoneician God Baal Melqart, to whom she was strongly devoted. The Bible, our only near-contemporaneous source for Jezebel, says nothing about the years immediately after her marriage to Ahab. However, it is clear that drought plagued the country. Since Baal was worshiped as a god of rainstorms who brought life and fertility to the land, it is reasonable to presume that the situation was ripe for the resurgence of Baal worship among the populace. This would make the introduction of a royal temple dedicated to Baal in Ahab's new capital of Samaria a tempting attraction. Thus, Ahab "set up an altar for Baal in the temple of Baal that he built in Samaria" (1 Kings 16:32). It is also probable that the "sons of the prophets," bands of ecstatic Yahwist devotees who attended the "high places" of Israel, took strong and outspoken exception to any sign of official support for Baal, whom they considered Yahweh's mortal enemy. In 1 Kings 17:1, the prophet Elijah appears at court and declares: "As the Lord, the God of Israel, lives, whom I serve, there will be neither dew nor rain in the next few years except at my word." A serious drought follows. Jezebel herself is introduced into the narrative in Kings 19, by way of background. Several years of drought have passed, resulting in a severe famine. Jezebel has begun killing off hundreds of the prophets of Yahweh, whom she and Ahab apparently hold responsible, along with Elijah, for the lack of rain. Elijah receives a new command from God to confront King Ahab, and the king agrees not only to meet Elijah but to arrange a contest between him and the prophets of Baal on Mount Carmel, which is strategically located, commanding the spiritual and physical high ground between the two capitals: Samaria and Trye. Elijah not only facilitates the spiritual defeat of Baal, but immediately presides over the massacre of 450 of the Baal's prophets. Rain clouds soon appear in response to Elijah's prayers. Hearing Ahab's report of the slaughter, Jezebel threatens to take Eljiah's life in retaliation. The prophet then flees to Beersheba in the south of Judah. With Elijah out of the picture, other prophets of Yahweh re-emerge, at least one of whom declares that God will give victory to Ahab in an upcoming battle against a powerful coalition headed by the Syrian king Ben-Hadad. The Israelite army gains the upper hand as predicted, and Yahweh's prophet counsels Ahab to prepare for another battle the following spring. This battle, at Aphek, too, is successful; but a second unnamed prophet soon condemns Ahab for allowing Ben-Hadad to live. Dogs will devour Jezebel by the wall of Jezreel. Dogs will eat those belonging to Ahab who die in the city, and the birds of the air will feed on those who die in the country (1 Kings 21:23-24). Ahab wins God's reprieve when he repents for killing Naboth. Ahab later meets his death after accepting the advice of 100 prophets of Yahweh who urge him to join with Jehoshaphat of Judah in a battle against Ben-Hadad at Ramoth-Gilead. Only one Yahwist prophet, Micaiah son of Imlah, had warned of disaster. Jezebel not only survives the death of her husband but also outlasts her nemesis Elijah and sees two of her own sons, Ahaziah and Joram, ascend to the throne of Israel. Years pass, and the prophets of Yahweh again emerge as a powerful political force. Elijah's successor, Elisha, even gives grudging support to Jezebel's son Joram, mainly because of his continued alliance with Jehosophat of Judah, whom Elisha respects. I will avenge the blood of my servants the prophets and the blood of all the Lord's servants shed by Jezebel. The whole house of Ahab will perish (2 Kings 9:1-10). The gruesome death of Queen Jezebel. 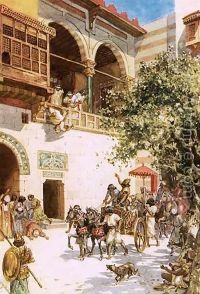 Jehu promptly rides to Jezreel, where King Joram is recovering from wounds suffered in battle. "Do you come in peace, Jehu?" the king asks. Jehu replies: "How can there be peace, as long as all the idolatry and witchcraft of your mother Jezebel abound?" Jehu not only proceeds to assassinate Joram, but also sees to it that his ally, Jehoshaphat's son King Ahaziah of Judah, is also slain. Jehu next turns to Jezebel's spiritual legacy. He summons the priests of Baal to a solemn assembly in the capital, saying, "Ahab served Baal a little; Jehu will serve him much." Once they assemble in Baal's temple, Jehu proceeds to have them all slaughtered, demolishing the temple and turning it into a public latrine. While Jezebel's male descendants are eliminated by Jehu's purge, he inadvertently paves the way for her daughter Athaliah to ascend to the throne in Jerusalem by killing Ahaziah of Judah. It should be noted that some scholars have argued that Athaliah was not the daughter of Jezebel and Ahab, but rather the daughter of Omri, Ahab's father, and thus was Ahab's sister. Athaliah is Ahaziah's mother, probably having named him after her own brother, Jezebel's son Ahazaiah of Israel. Hearing of Ahaziah's death, Athaliah begins a purge of her own in Jerusalem. She reigns as queen in her own right in Jerusalem for more than six years, both tolerating and encouraging Baal worship in Yahweh's holy city. One of Ahaziah's sons, however, remains alive. The boy Joash is placed on the throne by the priests of the Temple of Jerusalem after they succeed in a plot to murder Athaliah in the seventh year of her reign. Ironically, because Joash is Jezebel's great-grandson, this move places Jezebel herself in the position of the foremother of the remaining Davidic kings, from whom the Messiah himself was prophesied to come. In Christian tradition, Jesus was descended from this Davidic lineage (Mt. 1:8). He is, in that sense, not only the "son of David," but also the "son of Jezebel." Psalm 45: a more positive view of Jezebel? Bible critics have recognized for more than a century that the account of Jezebel and Ahab is strongly colored by the religious prejudice of its authors. Partisans of the "Yahweh-only" faction in Jerusalem, they cast Jezebel as a villain who tempted Ahab into Baal worship, brought God's wrath against Israel, and even spread her wicked ways to Judah through her evil daughter Athaliah. Some argue (see Finkelstein 2006) that the story of King Solomon's seduction into idolatry by his foreign wives is a backward projection of the story of Ahab and Jezebel by writers of the so-called Deuteronomist school of the sixth century B.C.E. Many wonder how accurate the story of Jezebel truly is, and Psalm 45, the wedding psalm, has been suggested as a possible alternative view of Jezebel, reflecting a northern viewpoint rather than the usual Jerusalem-oriented attitude found in the Bible. With the advent of feminist theology, attempts have even been made to cast Jezebel as a heroine who supported religious pluralism and promoted the recognition of femininity in the godhead. The latter view is hard to reconcile with the purported facts of the case, such as Jezebel's persecution of the prophets of Yahweh and her role in Ahab's murder of the innocent Naboth. However, even the biblical writers never directly show Jezebel engaging in violence, as they show Elijah conducting the massacre of 450 prophets of Baal. Nor does Jezebel's ruthlessness approach anything near the extremes of the supposedly righteous Jehu in his slaughter of the extended family of Ahab and his massacre of the priests of Baal under the false pretense of joining them in worship. Writers who saw these acts as praiseworthy would hardly balk at exaggerating the supposed sins of a woman such as Jezebel. One appeal of Jezebel for feminists is the biblical mention of her supporting 400 "prophets of Ashera" (1 Kings 18:19) along with the 450 prophets of Baal usually associated with her. Apparently Jezebel not only championed a revival of Baal worship, but also encouraged the recognition of the popular Ashera, Baal's consort. This would have especially antagonized the "Yahweh-only" prophets, not only because it promoted religious pluralism against their strict Yahweh-only policy, but also because it recognized femininity within the godhead, something the priests and prophets of Yahweh rejected. Archaeological evidence suggest that the worship of Ashera and/or Astarte (sometimes the two names seem to refer to one and the same goddess) was widely practiced not only in Israel but also in Judah, as late as the sixth century B.C.E., despite attempts by the male priesthood and prophets to stamp out her worship (Dever 2005). The true character of Jezebel may never be known. However, both traditional bible critics and feminist theologians can hardly be denied when they insist that the biblical portrait of her is a caricature. The name Jezebel has come down through the centuries to be used as a general name for any wicked women. In modern usage, a "Jezebel" is a manipulative, controlling, woman, often with sexually aggressive connotations. Such phrases as "painted Jezebel" refer to the scene in 2 Kings 9, in which the vain, elderly queen paints her eyes and does her hair just before being thrown to her death. Jezebel's name was made even more infamous by Bette Davis' Oscar-winning portrayal of ruthless southern belle "Julie" in the 1938 hit movie, Jezebel. A plethora of recent popular Christian books (see Clark, 1998) advise Christian women how to avoid manifesting a Jezebel-like character in marriage or how to overcome the "demons" that possessed the Bible's most wicked female. On the other hand, Jezebel is also the name of a successful women's magazine, as well as the name of a popular fragrance and lingerie line. ↑ Rudolph C. Klein, Queen Athaliah: The Daughter of Ahab or Omri? Jewish Bible Quarterly 42 (1) 2014: 11-20. Retrieved December 18, 2018. Howe Gaines, Janet. Jezebel, Phoenician Queen of Israel. Bible Review, October 2000. DeBolt, Virginia. Jezebel revisited. www.vdebolt.com. This page was last modified on 18 December 2018, at 21:57.